Its always a great part of the Homeless World Cup, catching up with old friends from previous tournaments. Some return as volunteers, some as coaches or as fans just to spectate. I caught up with one of these friends. 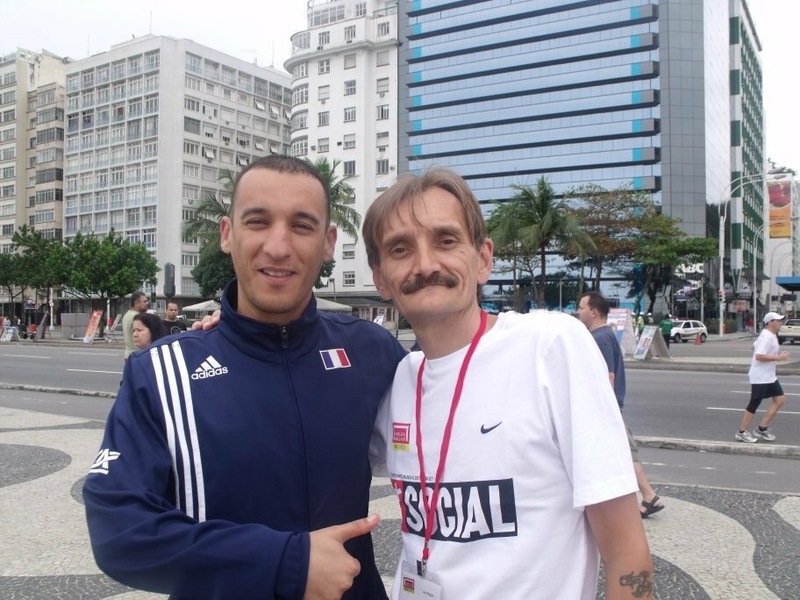 Arezki Saouli, as a player for France in Rio 2010 we spent many hours chatting at the players venue. He returned as a coach in 2011, in 2012 and in 2013 as a fan with his new bride. This year as a Coach he returns again. I wondered what makes people like Arezki (and me ) want to come back time and time again. ” it’s become a necessity for me, my second family. ” he spoke in English. ” I feel I have to be here if at all possible. It is infectious and a unique experience and we both agreed that it about being recognised first and foremost as a human being. It’s a feeling shared whether your a coach, referee or player. So why does football work in this way in so many countries? When summing up he said I don’t have the English to explain so he said in French. Simply translated it creates a collective spirit. Both on and off the pitch. Whatever the reason you come you will leave different. I’m sure this won’t be the last we see of Arezki or his like.